This should be interesting. On one hand: YAY! If they actually collect the deposit perhaps troublesome guests will be better behaved. But also: I’ve heard some real horror stories on how long it takes for Airbnb’s charge reversals to go through. As a guest I’d be irritated if Air charged the full deposit (when they never have before) and take several weeks to reverse the charge. I’m afraid we’ll be on the receiving end of this issue in the review. Which also makes me wonder: why are only the hosts being reviewed by guests? Why doesn’t the guest rate Airbnb itself, on how well they did as a middleman? Don’t kid yourself - this is about AirBnB protecting themselves, not the hosts. Their financial analysts probably told them how much money they covered from their own pocket in payouts to hosts for guest damage and they decided they didn’t want to do that anymore. We don’t know what exactly it’s about other than Airbnb may apply this to certain guests but we know for sure it’s a test so we just have to wait and see. I do however hope that this will help those hosts who have fought with guests over damages and other things when certain guests didn’t want to acknowledge their bad behaviour and/or the damages made. One could hope that Airbnb thinks this way but who knows. We haven’t seen them being on the side of hosts for a while but this might change with this. It could be as a few pointed out that it’s about the money (when isn’t it?) and that this measure will push the costs of compensation back to the guest in cases that require refunds of some sort. I wonder how the guests will perceive this and how it is communicated to them. This was sent to you as a host @Gem20, right? Not much of a change unless you can as the host deduct charges on the security deposit such as on vrbo. If you still need a person at Airbnb to arbitrate the issue it doesn’t seem to be much of a change. 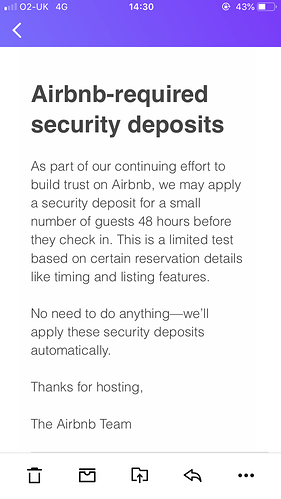 Airbnb is just collecting the interest on these deposits while they hold them “for us.” I agree with @Brandt it really is no change for our protection as hosts. Their financial analyst probably also told them that taking deposits would mean a enormous increase in capital on hand. Absolutely on point. And Allison H., as to why the guests don’t get to review Airbnb, well, Airbnb wants anything negative to be associated with the host, not the platform. 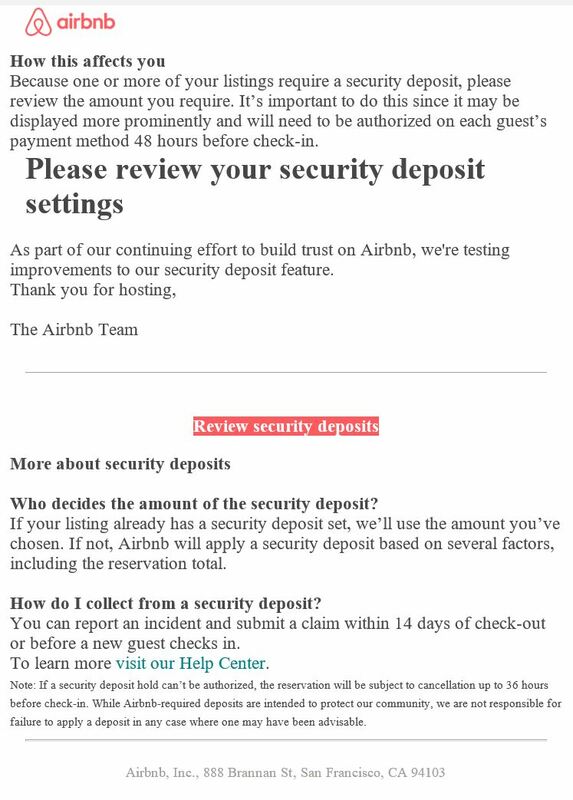 From the communication, it appears that Airbnb is determining the amount of the security deposit, which might differ from the host’s if they have one? I’m guessing their algorithm is not scraping for guests with negative/damage reviews from hosts, but is more broadly based on something like geo location damage payout history (party places such as New Orleans, etc.) or guest demographics (first time guests, etc.) Hmm, hope they’re not discriminating . . .
Another one here who agrees with @PitonView’s succinct analysis! I’ve never understood why there are SO many problems with Air’s security deposit system and hosts not being able to claim. Booking com, and other sites, allow you to collect your own deposit. They don’t seem to have any problems with that set-up, unless I’ve missed something. 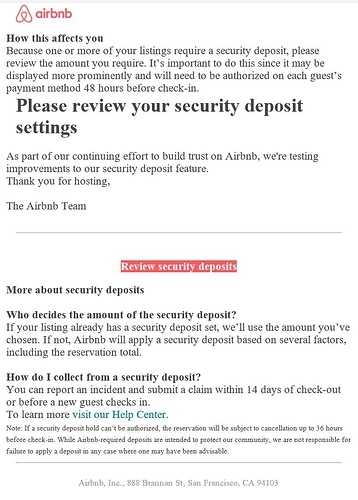 I got a different but related e-mail from Airbnb today titled “Update about security deposits”. This might be the same as casailinglady is referring to, but it’s a little different from the notification that Gem20 received. I don’t have a security deposit set and I have never filed any damage claim. I got that email this afternoon, too. 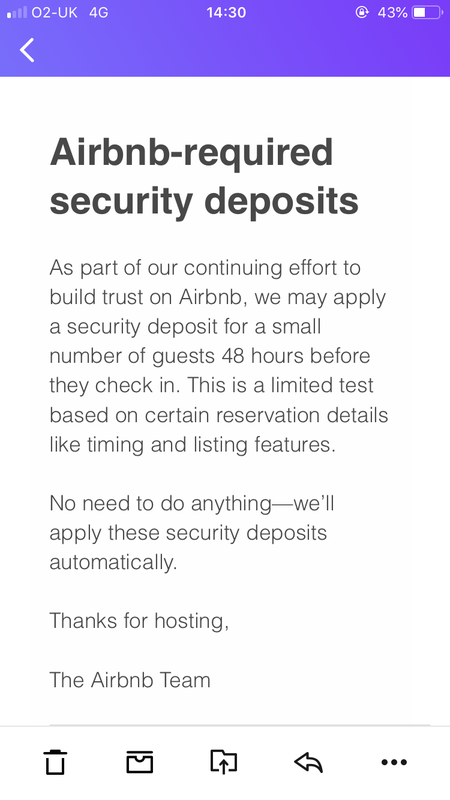 What chills me to the bone on this is the line: “If a security deposit hold can’t be authorized, the reservation will be subject to cancellation up to 36 hours before check-in”. Does that mean all a guest has to do is to shut off their credit card three days before they arrive, and they get a 100% refund even if your listing has a strict cancellation policy? I can’t imagine they would tell a guest they have to forfeit everything they paid because they can’t process a deposit. In once sense, I don’t think it’ll make much difference since it’s common practice for hotels and rental car companies to do this. However, I’ve read many horror stories written by guests about bad hosts, so I can see how some guests would be put off by a deposit thinking it will be a way for bad hosts to cheat them out of more money by faking damage or theft. The strange thing to me is if the host doesn’t set a deposit amount, Airbnb will set it and the one specific factor they mention they will base it on is the total cost of the reservation. I can kinda see the nightly rate being a factor, but not really the total cost. I can kinda see the nightly rate being a factor, but not really the total cost. @Brian_R170 - why not the total cost? Nightly rate times number of nights = a big chunk of total cost. More nights, more opportunities to break things. I got the same message as Brian_R170. I just removed my security deposits on my 2 listings ($500 and $800) which I have never had to claim on, because I’d like to see what Airbnb comes up with for deposit amount. My concern is if this is not being applied across the board those of us in the “experiment” will be at a disadvantage, with a a forced, extra charge to guests. That would be a reasonable way to charge for insurance, but not a deposit. There are more opportunities to break things, but the cost of repair doesn’t increase with the number of opportunities. Once something is broken, there’s a fixed cost to repair it. Another way to look at it is that a guest could have a wild party and break lots of stuff in one night (you can find stories like that very easily), and the deposit based on “reservation total” would be useless. My concern is if this is not being applied across the board those of us in the “experiment” will be at a disadvantage, with a a forced, extra charge to guests. Hopefully, it’s regional, so that all hosts in the same area will appear similar to a guest looking to book in that area. However, it does say “If your listing already has a security deposit set, we’ll use the amount you’ve chosen.” So in theory, you could choose a deposit value of $0.01, right? Neither did I, but I haven’t had time to go to the listing to check.